Hi everyone! I realized a few weeks ago that in the beginning of the year I posted what was supposed to be one of two giveaways. After the first one ended, I never posted the second giveaway! So it’s about time to fix that. Just like the last giveaway, this one is a gift certificate for Custom Quilling Supplies. You may notice sometimes in my posts I link to products at Custom Quilling. Custom Quilling Supplies is an online shop owned by Denise Cameron. She has a full range of quilling supplies including papers, glues, sealants, paper punches, accessories, stationary, tools, and oh SO much more. 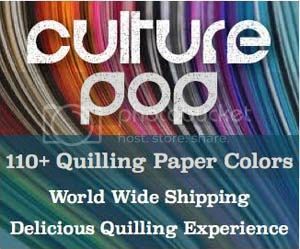 It really is a wonderland of quilling supplies and related supplies that you can use for quilling. As an affiliate for Custom Quilling, I get a small percentage of orders that are made through my affiliate links. A couple times a year I get a gift certificate in the amount that I have earned to use for orders. The fun thing is that I can also give that gift certificate to someone else! So, because I like to give back to you, my loyal readers, I am offering the gift certificate to one of you! The gift certificate is worth a little more than $10. It expires in November of this year. This giveaway is open worldwide, as Denise ships anywhere around the world. Keep in mind, though, that if you are making an order from outside of the US you’d have to pay the shipping. So if you don’t think you would use this gift certificate, please don’t bother entering, as I don’t want it to go to waste. Only enter if you know you will use it, please! There are many ways to enter, so get as many entries as you can! The giveaway will close on May 24th. 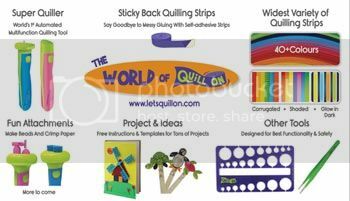 While you are waiting to see who won the giveaway, here are some fun products for browsing at Custom Quilling. Some of these are brand new quilling products out this past year. Yay! Have you seen this brand new slotted tool from Quilled Creations?? I can’t wait to try one! These ink pads come in many colors, and can be used to add a metallic edge to any quilling paper, or just a metallic accent to any quilled project, greeting card, etc. These little magnets are perfect for turning your quilling creations into magnets! Even though they are self-adhesive, I do suggest using tacky glue or something similar to glue it to your quilling to make it more sturdy, otherwise it has a tendency to sometimes come off when you take it off of the fridge. Here is another brand new tool from Quilled Creations! A Super Looper Quilling Comb, so cool! A gorgeous new quilling kit from Quilled Creations! Yes, another one! I like this one even more. Looks like Quilled Creations has put out a lot of new products in the past several months, wow! This paper is vellum, which is very smooth and is also translucent. This particular vellum from Quilled Creations changes color down the strip. Cool! It comes in different color schemes. This one is rainbow. This kit is a perfect gift for someone who loves making cards, but hasn’t tried quilling yet. Or maybe you want to learn some new flower techniques. Twelve lovely flowers! These lockets come in different shapes, colors, and finishes. They are so cool because they open by a magnet, you stick in your quilling or other little thingies, and close it up. You can change it any time you want! I would like to try the Highlights quilling strips and the adhesive back magnets. I can’t wait to try the border buddy one day! I love to give handmade gifts. I pay close attention to what interests my friends and create a quilled picture based on that theme. I frame it in a shadow box frame and it makes an original one of a kind gift. Definitely makes a thoughtful gift! I would love to use the quilling strips cringer, to make cringed strips!